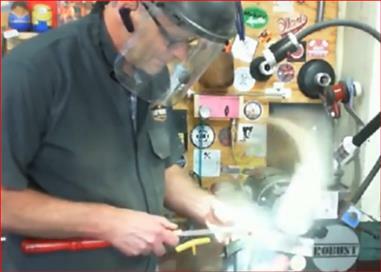 Personal Protection Equipment for Woodturners from AAW on Vimeo. Download our detailed one page AAW Safety Document to post in your Shop. For April 2019, info on "SPEED KILLS"
This months challenge is to turn a natural edge bowl which brings its own set of safety issues. Natural edge blanks are often uneven shaped and can present significant vibration problems due to being out of balance. In addition the natural edge is like a saw blade rotating close to your hand and the gouge you are using. So how do we minimize the risk? 1. Round the log using either a band saw or chain saw making sure the piece is sitting flat and not rocking. Wear proper safety equipment when using the saws. 2. Create a flat area on the bark side for the face plate or screw chuck by using a Forster bit in a drill press. Make sure the blank is held securely and hands are well clear of the cutting bit as the uneven surface can cause the blank to suddenly move. 3. Load the blank onto the lathe and capture it with a center in the tailstock for as long as practical. 4. Rotate the blank by hand to insure tool rest clears and get an idea of how out of balance it is. 5. Make sure speed is turned down then turn on lathe. Gradually turn speed up until vibration begins then back off until vibration disappears. The speed at which vibration appears will increase as you remove material and reduce out of balance, so you can adjust the speed up as needed. Speed can also be your friend when doing interrupted cuts as faster speed reduces the time cutting air and enables smoother cutting. Here is a link to a good article on speed. For January 2019, the subject is Workspace Housekeeping. Keeping your lathe and workspace clean and well maintained promotes safety. Get into the safety habit! For November 2018, the subject is NOISE. Yes... that's NOISE. We tend to look at workshop safety as protecting ourselves from flying workpieces, cutting ourselves with power saws and wood dust that contaminates our lungs. This months American Woodturners has a very interesting article on the damage noise in the workshop can cause to our ears. The attached article focuses on the noise that certain tools and harder woods can create and the potential for damaging our hearing. For October 2018, the subject is Dust. How careful are you with wood dust? All wood dust is potentially harmful, but some are more dangerous than others. Check out this link to see which ones are most harmful. For September 2018, the subject is First Aid Readiness. For August 2018, the subject is Chainsaw Dangers. For July 2018, the subject is Helmet Safety. Check out this short video. For May 2018, the subject is Chain Saw Safety. Check out the great AAW article. For April 2018, we have a "safety fail" story and an important article on face shields.